I think of Doris Day as the icon nobody really knew, and I’m thinking of her these days because, just down the Californian coast from me, in Carmel, that eternal, perpetual, cute tomboy blonde next door, she of the undying smile and unequalled decency, who could sing so well you spent hours listening to her, will be 90-something next April 3rd. Somewhere down there, tucked away, she lives with a quantity of four-legged animals, the objects of her affection. She doesn’t do interviews; she isn’t interested in her own legend. So this can be no more than a fond card to someone a generation adored but never really cornered – that’s the mystery I find intriguing to this day. She has been away so long, you may have wondered if she was still here. Her last movie – With Six You Get Egg Roll – was made in 1968, when she was a mere 44. Maybe she had heard those jokes about the soft focus of her last films, took the hint, and elected to rest up on her small fortune. Because, only a few years before, from 1961-1965 with pictures like Lover Come Back, That Touch of Mink, and Move Over Darling, she had been the top box-office attraction in the world. So, she must have been rich, right? Well, yes, as it happens, but it is a complicated story. She was born Doris Kappelhoff in 1924, in Cincinnati, Ohio. Her father was German and Catholic, a musician and a conductor, who left the family for another woman when Doris was 12. Doris showed nothing. Instead, with a boy named Jerry, she formed a prize-winning dance team. They were about to take up a Hollywood offer when a locomotive hit the car she was riding in. Her right leg was wrecked – she couldn’t dance for years. She was 14. But she didn’t back off. As she convalesced, she taught herself to sing by listening to Ella Fitzgerald records. By the time she was 17, she was singing on a local radio station and was noticed by bandleader, Barney Rapp, who changed her surname to Day. Over the next few years, she sang with Bob Crosby’s band and eventually made a name for herself when she became the lead vocalist with Les Brown’s band. Soon she married a trombone player, Al Jorden. He beat her and demanded that she abort her pregnancy. Doris stood up to it all. She left him and kept the baby – her only child, a son, Terry. But she married again, to a saxophonist named George Weidler. She had a hit record, Sentimental Journey, with Les Brown, and a movie contract with Warners. And she was Doris Day now. 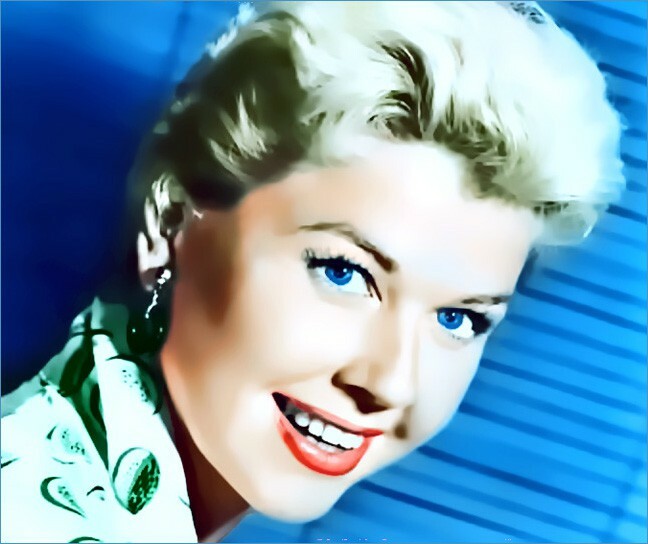 Weidler was intimidated by her fame, said he didn’t want to be Mr. Doris Day, and left her. Warner Brothers reckoned they had a sweet, true songbird, and in the late 1940s and early 1950s, they paired her with bland guys in movies with soothing titles – My Dream Is Yours, It’s a Great Feeling, Tea for Two, On Moonlight Bay, I’ll See You in My Dreams, By the Light of the Silvery Moon, Lucky Me. These were uncomplicated musicals in which a tomboy friendship blossomed into ‘Gee! I must be in love’. She sang the songs and kidded with the guys – Gordon MacRae, Dennis Morgan, and Jack Carson. There was a real romance with Carson, and some said another of her co-stars, Ronald Reagan, was soft on her. There were two tougher pictures: Young Man With a Horn, where she was the suffering girlfriend to jazz trumpeter Kirk Douglas; and Storm Warning, a drama, in which her husband in the film, Steve Cochran, proved to be a member of the Ku Klux Klan. She was pretty good at being a sweetheart with a vicious jerk for a husband. She was very popular, but her material was old-fashioned. Then, as she reached 30, three pictures raised her to a new level. Calamity Jane (1953) was a musical about Wild Bill Hickock and his tomboy sidekick. It proved a box-office smash, and it gave Doris the song Secret Love, a hit record and the later basis of her status as gay icon. Young at Heart (1954) is a noir musical in which she marries a creepy, failed songwriter, played by Frank Sinatra. Doris responded to his nasty manner and foreboding: they made a maudlin chemistry. Then, in Love Me or Leave Me (1955), she played torch singer Ruth Etting, whose husband-manager treated her like a punching bag. That role went to Jimmy Cagney. He and Day took one look at each other on the set and clicked. It’s still a very good picture, with Doris, in a low neckline, singing Ten Cents a Dance and I’ll Never Stop Loving You, and swapping cracks and slaps with Cagney. By now, Doris was an authentic star on screen and in the hit parade. She had a third husband, Marty Melcher, who managed her and was famous in that everybody loathed him – except for the nicest blonde anyone knew. Through sheer conviction, she carried off some challenging films – not least, Alfred Hitchcock’s The Man Who Knew Too Much (1956), where she sang Que. Sera, Sera; Julie (1956), in which she had to land an aircraft without training; and The Pajama Game (1957), the Stanley Donen musical where she was a union leader in a garment factory. It was an age of blondes: Grace Kelly, Marilyn Monroe, Kim Novak – but Grace went legit, Monroe cracked and Novak made some flops. Doris just got bigger, and on the eve of feminism, she played career women who acted like coy ingenues in what were supposed to be sophisticated comedies. This is the ‘professional virgin’ period with films such as Pillow Talk, Lover Come Back, and That Touch of Mink. Her co-stars were Cary Grant and Rock Hudson, and the films were hugely successful, no matter that in the next few years their prissiness would be ridiculed. She actually got a nomination for Pillow Talk (Simone Signoret won that year for Room at the Top – like absinthe after Coca-Cola). The success overlapped with Jane Fonda and real bedroom scenes. At which point, in 1968, Marty Melcher died. Everyone except Doris said, ‘I told you so’ when it was discovered that he had either wasted or embezzled a cool US$24m of her money. Doris didn’t waver. She did the TV series that Melcher had committed her to without her knowledge. And then she set about suing Melcher’s lawyer, eventually recovering only about $6m paid in annual installments. Don’t mess with Doris, people said. Then she was gone. Once retired, Doris became a gay icon. Secret Love was an anthem in gay bars. There was a brief, fourth marriage to a restaurateur. Maybe she settled for dumb animals. Maybe she made mistakes with men and had strangers for her best admirers. John Updike wrote a review of her autobiography Doris Day, Her Own Story (1976) in which he admitted affection – without ever having met her. 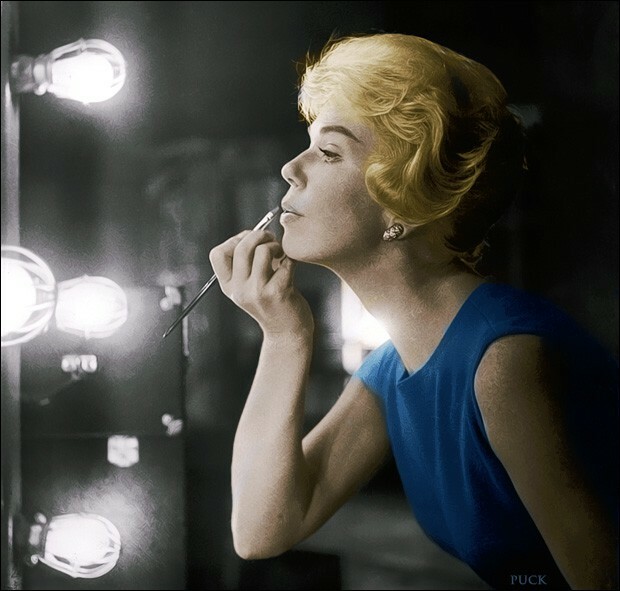 It’s still a mystery, if you listen to Doris in her great songs or her good movies, plunging into the romance, to wonder what left her cool or impenetrable later. Our loss. Happy Birthday, Doris! There are lots of us who make no secret about what we feel for you.